It’s been a big week for the Duck Dynasty clan, who traveled to New York to do some press events and then apparently decided to do some autograph signing. Willie Robertson, who stars in A&E’s popular reality drama, headed to Cranberry Township, Pennsylvania to sign stuff for fans but ended up crashing a wedding, much to the excitement of the wedding party and wedding goers. Charlie Miller and Mehgan Cook had already planned an unconventional wedding well before Robertson crashed it. The young couple spends a lot of time outdoors fishing and hunting, and they opted to get married in a brand new sporting goods store in their area called Field & Stream. According to the 26-year-old bride, this was her dream wedding. Miller and Cook are also huge fans of Duck Dynasty. When they found out Robertson was going to be in town, Cook even thought about delaying her nuptials so that she and her partner could meet the famous reality star. They eventually decided that it wasn’t a feasible idea, but it turns out that avoiding the wedding would have been a bad call, since the star showed up to see the couple tie the knot. She wore a camouflage sash and he wore his hunting boots. The Duck Dynasty star was pleased as punch to show up for the event after the store explained the couples fandom to him. Robertson later told Pittsburgh news outlet WTAE4 that he identified with the young couple. The wedding seems like a pretty casual affair, which is good news because Robertson showed up in some casual clothes and his signature bandana. Still, adding a little celebrity to any event will usually make a lasting memory. 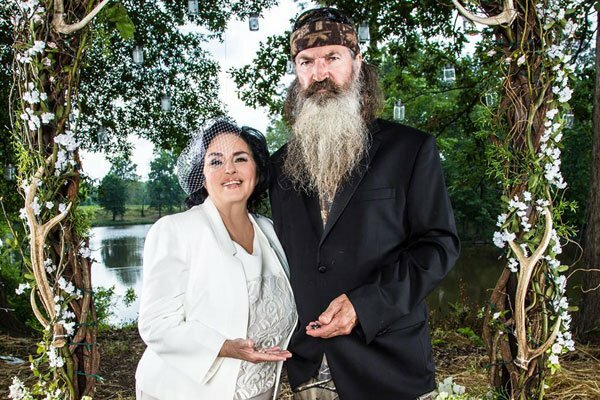 Duck Dynasty recently featured some nuptials of its own. The Season 4 premiere episode broke network and even cable ratings, thanks to featuring the nuptials of clan heads Phil Robertson and Miss Kay, who have been together for more than fifty years. More than 11.8 million people tuned in for that episode, and I’d be willing to bet that Miller and Cook are included in those numbers. Duck Dynasty airs on Wednesdays on A&E at 10 p.m. ET.